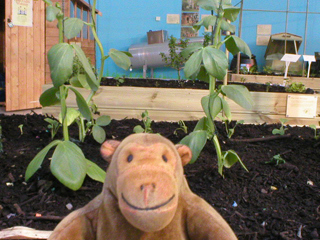 "Apparently you can grow a lot in an allotment"
Mr Monkey scampered around to a section where vegetables were planted in raised beds. He found out all about growing vegetables on allotments, and learned about composting, but stayed away from the table where small children were painting pots. He prefers to avoid excited humans in close proximity to coloured liquids. 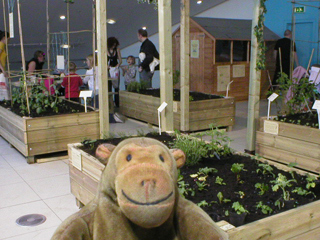 You can read about allotments at the National Society of Allotment and Leisure Gardeners Limited website.